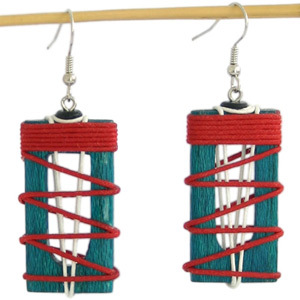 Working with colorful nylon threads and sustainable kapok wood, artisan Benjamas handcrafts an original pair of earrings. They hang from stainless steel wires. This handmade item may vary slightly in colors, weight and size. Color discrepancies may occur between this item and your computer screen. Materials: Kapok wood, nylon and stainless steel. Mrs. Benjamas Siriraungkeaw grew up in a woodcarving environment. 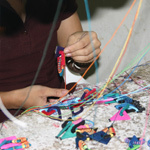 She started to design and craft small wooden accessories for ladies at an early age. Years later, she worked in a jewelry shop for a decade, where she learned about jewelry designs and trends. She now has set up on her own. 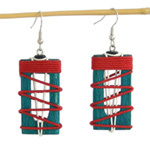 Her designs are an interesting and colorful combination of wood and various materials. The wooden structures are crafted by her in-laws and, with the help of her daughter and husband, she finishes off the designs. She works from her home in Chiang Mai, where she now trains and employs several workers.